Even before you enter the Desert Museum, your introduction to its residents begins. 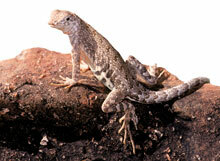 In a low-walled enclosure near the front gate is small massif of rock, inhabited by several of the Sonoran Desert's many species of lizards. On warm days they position themselves like sunbathers on a beach, catching the rays to raise their body temperatures, which like most reptiles vary directly with their surroundings. Many people are startled by the small, piglike animals standing about the entranceway. 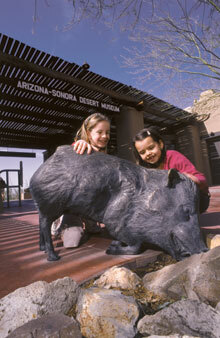 But these are bronze likenesses of the real thing, called javelina, which will appear later in your visit. Once inside the Museum's main patio, you're likely to spot one of the ASDM docents giving a demonstration talk with the help of a live animal such as a Western Screech Owl, a gopher snake, or even a very large and hairy, but harmless, spider called a tarantula. These animals are members of a kind of peculiar United Nations housed at the Museum, serving as ambassadors for their wild relatives.